Do you want to have a set of healthy cookware? Do you want to cook greaseless while the cooked food retains more nutrient and flavor? Do you want to cook with less effort and less time? The answer is definitely YES for everyone. Everyone wants to have a world's Finest waterless cookware. But like other products, there are so many cookwares in the market,and each manufacturers and sales are claiming that theirs are the best. Most of us are really confused. Don't worry, I did research and already found you the best cookware that can meet all the above your requirements. That's Maxam KT Ultra17 World's Finest 7 Ply Steam Control 17pc Surgical Stainless Steel Waterless cookware set. Let me explain why it is this set of waterless cookware. Traditionally, cooking in water removes more food nutrient,taste and color. Now waterless cooking method avoids this. You don't need to add water, or only add very little water such as 1 tablespoon,2 tablespoons,etc. You cook in food's nature juice. ( most food contains much water,click here to see). Waterless cooking needs special cookware-- Waterless Cookware. 1. Multi heavy plies, at least 5 plies.Usually outside ply is consist of stainless and inside plies are aluminum and aluminum alloy. 3. Using surgical stainless steel in the construction. 4. Stainless Steel both inside and outside. 18/8* is ok but 18/10* is better. Waterless cookware's lid covers tightly and snugly, and the multi-ply heavy bottom spreads, conducts and maintains heat very well. Making use of water containing food itself, the steam and the vapor continues to circulate forming a steam-box-like for vegetables, or a small hot-oven-like for meat and baking food. As it's in near waterless environment and sealed cooked, cooking time reduced. So more vitamins and minerals will be retained. Study shows that 98% nutrient will be preserved. (regular cookware only retains 58% nutrients). This is really a great good news for vegetarian. Right? Because of its heavy multi-ply bottom, heat spread fast and evenly. So you don't need to worry about "hot spot". Even if you cook chicken without add any oil and water, there is no any burn point. When finished cooking,it's so easy to clean the cookware. Waterless cookware uses medium to low heat (never use high heat),avoiding high temperature cooking. High temperature cooking is easy to cause sugar to degradate to antiglycation end products(AGEs), which may cause blood vessle embolization and increase the volume of certain protein in blood such as C-reactive proteins(CRPs). High volume CRPs presage myocardial infarction or stroke attack. Among all the the waterless cookwares, Maxam KT Ultra17 World's finest 7 Ply Steam Control 17pc Surgical Stainless Steel Waterless cookware set is commented the best by the users. World's Finest Waterless Cookware Set is made by Maxam which has more than 50 years history of cookware production(located in Texas). 7-ply construction. Better than 5-ply, it spreads heat faster and more evenly, and maintains heat better. But 9-ply is too heavy. So 7-ply is the most appropriate. World's Finest Waterless Cookware Set contains carbon steel core between the stainless steel plies. This allows you to use this model cookware on induction top stoves as well as gas, ceramic, and electric. Most other waterless cookwares don't have this feature. If you use induction top stoves and want to buy waterless cookware, you must buy this model. Even if you don't use induction top stoves now, your daughter may use when you pass this set of cookware to her. Maybe, who knows? It'll still shine at that time. World's Finest Waterless Cookware Set allows you to stack cook. Start cooking each individual saucepan on a burner until you hear the steam valve whistle, then simply stack the pot to complete the cooking process. Heat, of course, is transferred from the bottom pan to the top. World's Finest Waterless Cookware Set comes with whistle valve which lets you know when to reduce the temperature. The double boiler unit has a capsule bottom so that it can be placed directly on your stove-top as a cooking utensil when it is not being utilized as a Double Boiler Unit. You are buying a lifetime long item, why not to choose a prime brand? Let's see what benefit you'll get if having a set of World's Finest 7 Ply Steam Control 17pc Surgical Stainless Steel Waterless cookware Set. 1. Keep more nutrient. It reduces the loss of water-solubility vitamins if you don't add water or only add very little water. For some vitamins such as B12 can be most kept under this non-light,low-pressure cooking method. You'll retain 98% vitamins and minerals compared to 58% retaining by regular cookware. 2. Reduce grease and fat intake,oil is used just as an ingredient. You even don't need to use cooking oil if you don't wan't to. 4. Avoid high temperature cooking. High temperature cooking is easy to cause sugar to degradate to antiglycation end products(AGEs), which may cause blood vessle embolization and increase the volume of certain protein in blood such as C-reactive proteins(CRPs). High volume CRPs presage myocardial infarction or stroke attack. 5. You'll love to eat food cooked by waterless cookware as the food shrinks less,keeping original shape and color. The more important is that it's more flavor. The natural sugars and salts come to the surface of the food, the food is not only nutritional but also tastier. 6. Avoid bacteria growth. 304 Surgical stainless steel prevents the growth of bacteria because it is corrosion resistance, temperature resistance,and is not easy to be scratched or warped.. Hospitals use surgical stainless steel utensils because it's easier to keep sterile. 7. Protect the food from leaching or from contact with metal because the surgical stainless steel provides a pore-free surface. 9. Saving time and effort. Stack cook allows you cook different food in dfferent cook tools at the same time. Whistle valve control eliminates the trouble for you to check and monitor the food from now and then. 10. Your kitchen will keep cool when cooking as it cooks in low to medium heat (never high heat). 11. Convenience and saving your trouble as you don't need to stir fry often and don't need often to check if the food is done. 12. Easy to clean as it's stainless steel both inside and outside,and no burn spot. 13. The heat-resistant phenolic handles make you feel cool and very comfortable to handle as they are superbly styled and are resistant to heat, cold and detergents. 14. Save you lots of cabinet space. You can hung them on a rack using the large eyelets molded into the handles(Each handle is molded with a very large eyelet).Or you can invert the covers on the pans, nest them and place them in your cabinet. 15. Life time warranty. You can even pass on to your daughter and granddaughter while it will still shine due to the high grade surgical stainless steel. Minimum oil used,waterless is regarded the healthiest way of cooking so far.It'll reduce the risk of illness and reduce the symptoms of patients, especially for those who are afraid of grease and fat such as obese people, diabetics, hyperlipidemia, and heart diseases patients,etc. Now you can save money and time which are used to see a doctor. As it retains 98% vitamins and minerals in the food, you don't need to buy vitamin supplements. Further more, it's more nature and healthy to ingest directly from the food you take. "It is VERY expensive(he must have bought at US$2000-5000, but you don't need to cost so much now)but if you ever sat through a Lifetime Song and Dance at a home show, you would think you are actually killing your family if you don't buy this stuff." "It is very high quality cookware and will last a lifetime. However, if you aren't going to buy into the lower heat waterless concept (which preserves vitamins and minerals) you are simply buying good cookware. The idea is to actually buy into the concept of how to cook for better health." Waterless cookware is usually sold at cook parties by sales and the price is as high as US$2000 -5000 for one set. 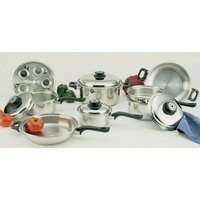 But now you can buy online, usually priced at US$300-500 for this World's Finest 7 Ply Steam Control 17pc Surgical Stainless Steel Waterless cookware set. I did lots of compare and following up. I found that Comfortfirst has been always keeping this model at almost the lowest price among so many websites while providing very good service, and allowing return. You may do a search by google, and then come back Comfortfirst. Invest less than US$0.9 per day for your health with so much benefit is really a good deal. You and your families will benefit a lot from the day you use it. You may say goodbye to the vitamin supplements, obesity, or other diseases, or even doctor. Image, you use regular cookware,you have to buy vitamin supplement, that'll cost you more than US$329.95* for several months. And waterless cook helps you keep vitamins and minerals in nature way. More healthy! It's life time warranty. Many people have been using their cookware for 40 years and more,and for this set of waterless cookware,you can even pass to your daughter,granddaughter,making them enjoy healthy cooking! Therefore,the cost becomes more reasonable when spread out over the years of use. More over, it's a risk free buying action. If you feel uncomfortable with it, Comfortfirst allows you to return within 30 days. If your buget is tight and don't need the function of working on induction top stoves, then you can choose Maxam 9 Element Set . Or choose the stock pot single unit. It has 30qt,24qt,16qt different size. Do you have any experiences on waterless cookware? Do you have any experiences on waterless cookware? Share here with friends!